I've fond memories of Seas of Blood - none concrete, but something inside me went 'whoopee!' when I picked it up. I remember this year at high school, I think it was 1994, where I pretty much got fantasy/dungeons and dragons kind of stuff out of my system - in that year I borrowed from the school library a ridiculous amount of Terry Pratchett, the complete Lord of the Rings, and kinda wound up my thing with Fighting Fantasy too. The following year music, girls and being a proper teenager kicked in, you see. But one of those last books I remember indulging in was Seas of Blood - you're a pirate, one of the best two in the land. Your infamy hasn't resulted in your arrest somehow, nor has it for your rival, Abdul, a turban-clad Middle Eastern-looking dude (it was the 1980s, I'll cut them some slack if you will). You agree to a contest to see just who is the best pirate - in 50 days you agree to meet a town down the coast, and whoever has the most gold wins. I rolled some real high numbers for my crew, just as well since I figured there'd be a fair few fights in the next 50 days/45 minutes. Unfortunately, my skill and luck rolls were pitiful (hello Mr and Mrs seven), so I decided boat fights were okay, hand to hand, not so much. We started off in Tak, described as 'the greatest den of thieves, criminals and cut-throats the civilised world has ever seen'. Hmm, how about that other greatest den, Blacksand? Or should the two cities I dunno, agree to meet in 50 days and see who has the most ill-gotten booty? Anyway... knowing the strength of my crew I immediately set sail for a wealthy town nearby, Lagash. I dispatched a ship on the way, scoring for myself 68 gold, which is where I realised I'd no idea how much I'd need to complete this book. It makes it more realistic not knowing, I suppose, but was 68 gold a lot? Did I need 100? One million? After trashing the ship, apparently I decided Lagash was too dangerous to attack. Err, I won this fight didn't I? What kind of pirate am I? I hit the next locale, murdering a bunch of priests in the process, only to realise I was down to two crew points already - only 10 days and not even a quarter of the way down the coast. Hmmm. I knew there'd be fights, arrr, but nothing like this! I collected a few slaves on my travels, hired a few extra crew, and eventually found myself assaulting Kish, which was defended by a Sith Orb. Err, I thought this was a while ago, in a land a decent distance away, not a long time ago in a galaxy far away... Some insanely lucky dice rolls (not my actual luck score, which was down to two) got me past it, but not the storm which trashed my boat on the way to Nippur. Some pirate - I survived being attacked by winged beasts, sword-weilding priests, and entire town militia and a tree (don't ask), but was drowned in a storm. Johnny Depp would be ashamed (you really didn't think this entry would be complete without a link to that, did you? Or how about this?). My guess Seas of Blood would be full of fighting was correct, but so many of the rumbles just seemed like random dice rolling - it was one after the other, without much inspiration, it seemed. Another problem was that once you left port from Tak, there was no word, at least in my game, of what Abdul was up to. 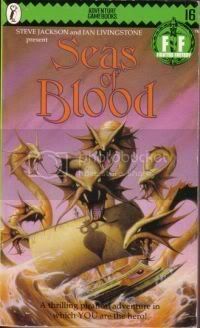 Previous books in the series, like Deathtrap Dungeon, at least tried to incorporate developing secondary character plots within the limiting confines of a FF book - Seas of Blood can be considered a missed opportunity, no doubt. All in all, not as interesting as I remember, just a dice-roll book really. Disappointing. Though I bet if I'd won the bet, I'd be saying otherwise! I didn't mind this one, but found it frustrating. You basically need to succeed at almost everything to win, although there is some flexibility to which route you take. I don't think its any huge secret to say that you need 800+ gold pieces to beat Abdul. There is a final fight right before you meat Abdul which is pretty good, where you basically get to pick which body part you attack of a huge Cyclops, and the wrong one reduces your stamina, while the right one brings you closer to victory.